I’ve never really been the girl worried about using natural or organic products. I avoided researching toxic beauty products because I didn’t want to stop using my current favorite products. I mean what you don’t know won’t kill you, right? That may be a little closer to the truth than I’m willing to bargain with. I immediately downloaded the app Think Dirty based on a recommendation from my friend Becca Bristow. I started looking up the products that I use every day and adding them to my “beauty cabinet” so I can keep tabs on all of my products and the overall safety of them. 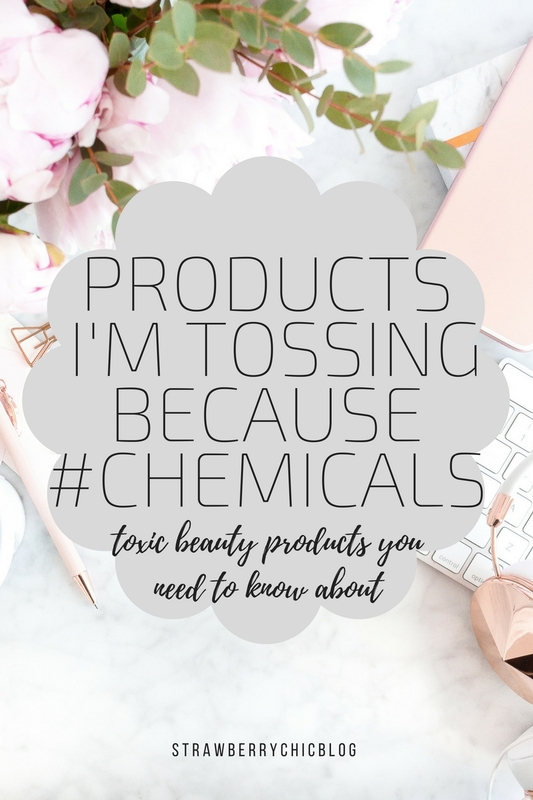 Some of my most beloved products were in bright red before my eyes, meaning really toxic! Some just had one product that was bad, usually synthetic fragrance, while others had multiple products linked to cancer, hormone imbalances, and infertility. Using Think Dirty makes it really easy (and almost gives you no excuse anymore) to check if your products are safe. Before, you had to look at the label yourself, and unfortunately, beauty brands try to hide toxic chemicals on the label by using less known terms. Think Dirty does all this work for you! The app makes it super easy to learn from and links to research if you need a little more convincing. Think Dirty also makes their recommendations for safer alternatives if you have no clue where to start. I find better success searching products individually verse using the bar code scanner, although there are some products I use routinely that I couldn’t find in the app. Products in red (aka dirty) is considered toxic and rank greater than 8/10, products in yellow is 5-7/10 and is considered half n’ half, and neutral (clean) products are 0-3/10. Moroccan oil dry shampoo – This product was the hardest for me to stop using. It’s been a favorite for years! The vanilla fragrance is the chemical to blame for the toxicity. Donna Karen deodorant – another product I’m sad to stop using. It smells so good! I still periodically reach for it when I know my natural deodorant won’t do the job. For example, if I have errands to run after a workout, or after self-tanning, because no one should have to smell me after a few hours of wearing self-tanner… lol. Hemps lip moisturizer this was a surprise to me because I thought Hemps was a natural beauty line! This is exactly why you should check every product you use. All of my body washes had to go because of fragrance. Neutrogena Anti-Residue: this had a form of formaldehyde in it!!! A well-known cancer-causing agent. I definitely tossed this! Duo lash glue: this also has formaldehyde. It went straight to the trash. Castille unscented soap (0/10) – it smells like basically nothing and isn’t exciting by any means, but it gets the job done. I recently make a face wash out of it and can share my recipe with my essential oils if you’re interested. There are so many ways to use it around your home, but I haven’t ventured into that yet. Vita Liberata self-tanner (1/10)- I figured self- tanner would be a hard non-toxic product to find, but this was the first one I tried and I’ve been impressed with it so far! When I first received it, I was not thrilled with the size of the bottle for the price tag. I’ll chat more about this at the end of the month! Native deodorant: This has been my daily deodorant since the switch and it gets the job done, but doesn’t compare to the antiperspirant I’m used to. If you wear a sweater or a thicker top, you will probably notice a little wetness, which isn’t my favorite. However, it’s not on the Think Dirty app so I will probably try a different one next time to be sure. When my It Cosmetics CC cream is used up I want to try out this version from Juice Beauty or this BB cream from Tarte. Safe hairspray were pretty limited, but there are two from Loreal I plan to try when mine runs out. I found it interesting that some brands varied greatly from their toxicity levels. For instance, when looking at Burt’s Bee’s, Aveeno, and Laura Mercier, some products were clean while others were 10/10 dirty. To be safe, I would recommend to always look up every product before adding it to your routine. It can be overwhelming at first, but after you wean everything down when you can replace your items with non-toxic products gradually. Don’t feel like making the switch to non-toxic beauty products has to happen overnight! Go your own pace and make subtle switches to keep chemicals out of your routine. To be honest, I think it’s ridiculous that we even need to research the products on our shelves. Especially considering how difficult and time-consuming it can be. And my question is… WHY? Why is there formaldehyde in my shampoo, a known cancer-causing chemical…Why is this ok? I hope that one day, companies will realize the harm they are potentially causing and will make more ethical decisions when it comes to the ingredients in their products. But I’m sure that won’t happen until there is a shift in the consumer demand. So until then, my goal for this year is to get my routine toxicity down to <5/10 on the app, so some half n’ half products will stay in my routine unless I find something cleaner that I love to replace it with. I just wanted to clarify that Think Dirty IS NOT sponsoring this post. You can also search products and learn more information about toxic beauty products at the EWG Skin Deep website. What are your thoughts on toxic beauty products? Oh my gosh! I have been avoiding researching this because I didn’t want to hear the truth. I am so shocked about some of the products you mentioned that have a high toxicity. Esp. the Laura Mercier setting powder!! I use a lot of these products daily and I was just about to buy the Moroccan oil dry shampoo! Thanks for the info, I’m definitely going to download the app now. Crazy! Next step, Amanda, is to avoid “cruelty free”! Why avoid cruelty-free products?? Or do you mean avoid animal tested products? Just want to clarity since I’m a newbie, lol. Love you! Hi, your skin looks great. What foundation are you using in these pictures and lipstick. I been trying to go toxin free as well, with everything. I use ewg, but I’ll have to try the Think Dirty site also. I haven’t found a clean full coverage foundation that I love so I use NARS radiant longwear foundation because it’s relatively safe to use! For everyday I use the Beauty Counter skin tint. I would trust the EWG website over Think Dirty.. Since writing this post I learned the app receives money for their reviews and they have removed some 10/10 products.